Sugarloaf is a huge granite spire towering over the town of Kyburz on highway 50 between Placerville and Tahoe. 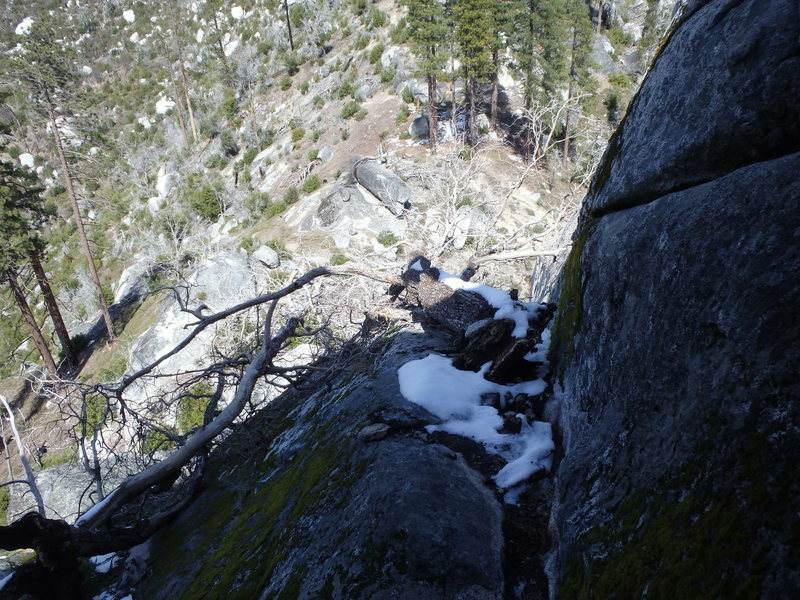 It is considered an excellent winter crag because of its lower elevation and mostly south-southwest facing position. There's both sport and trad, with single and multi-pitch routes of grades both easy to moderate, as well as full on hard committing routes that will test the strongest and boldest of climbers. The spire is about 350 feet tall and you can walk off the uphill side without much difficulty. The Sugarloaf area also includes a handful of smaller rocks that you can find along the trail leading up to Sugarloaf proper. These rocks hold a slew of low to moderate quality routes and boulder problems, with a few classics thrown in. Routes on these rocks can range from easy 5th class to extremely difficult and vary in height between 40 and 100 feet tall. The climbing area, and the Pony Express Trail that passes below it, are both in Eldorado National Forest. You can always check the ENF Website for recent information. But access to the Pony Express Trail and climbing areas uses public right of ways over private land. As always, please respect the locals the live and work in Silver Fork and Kyburz as you hike in and out of the public playground above. Local businesses, including gas stations stores, a cafe, and an inn, are just uphill and downhill from Sugarloaf on highway 50, in the towns of Silver Fork and Kyburz. There are some options for camping in the area but they are undeveloped, few and far between. 1) Drive just up the hill (east) on HWY 50 to Silverfork Rd. There are several pullouts just a few miles up the road that allow for overnight camping. However, the gate closes for the winter, so if it's snowy and icy, chances are the gate will be closed. 2) Drive down HWY 50 (West)and make a right onto 31 Milestone tract. There is a large pullout that allows camping. This road also closes in the winter months but tends to stay open longer than Silverfork Rd. 3) There is year round opportunity along Ice House Rd. Located several miles back (west) down HWY 50, Ice House Rd offers year round primitive camping along numerous pullouts and dirt roads. From the Bay Area, head East on 80 to Sacramento, then take 50 East, through Placerville and another ~30 miles (if you see the town of Kyburz sign and gas station, you've gone half a mile too far). After passing School Road, look for a dirt pullout on the right shoulder, on the south side of the two lane highway, and park there. Across the road on the north side you'll see a building with a locked blue outhouse on the left. This is basically half way between School Road, and Larch Lane. 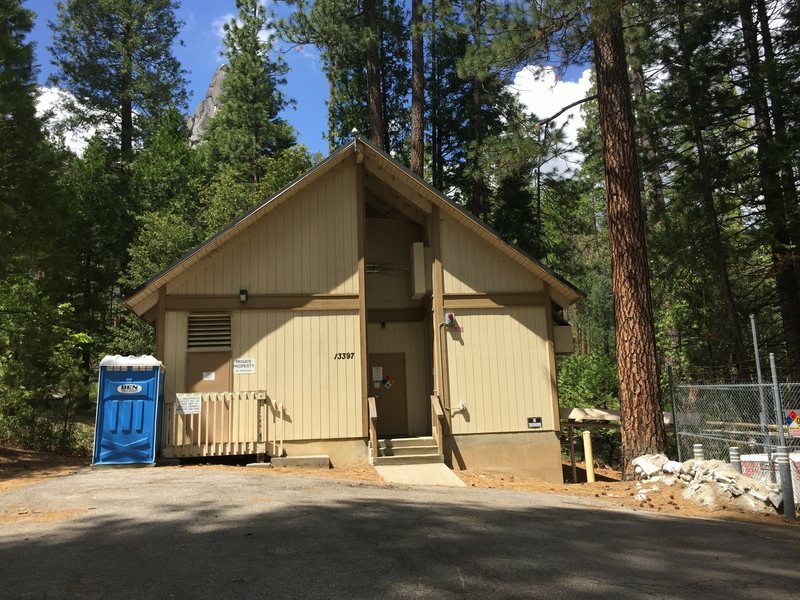 Once parked, walk to the east end of the dirt pullout, and carefully across highway 50 to get to the left side of the outhouse and fence around the building. Walk uphill for ~200 feet and you'll find a 'now entering forest service land' sign. From here a climber's trail is obvious and you just walk up it to the crags. Sugarloaf is about a 30 minute hike straight up the hill. From route 50 to the base of the main formation, it's about 600 feet up over half a mile. A more adventurous approach is to start down at 31 Milestone Tract, and find the Pony Express Trail from near the domes there. Over less than 2 miles of trail, it reaches the elevation halfway between route 50 and the base of the main Sugarloaf. This approach can be done on foot or fat tires (assuming you bring a means to secure your bike out of sight while you slog to your wall or boulder at Sugarloaf). CRAGS, the local Access Fund affiliate, with the support of the forest service, is beginning new projects to help improve access to Sugarloaf. "Grand Illusion". Photo by Blitzo. Atop Sugarloaf, above the Grand Illusion roof. Sugarloaf, 1982. Photo by Blitzo. "The Ghost In The Machine". Photo by Blitzo. Just a tip regarding the weather link for this page: my recent personal analysis and actual experience has been that Weather Underground (much as I love that site) does not portray an accurate forecast for the Kyburz area. Use noaa.gov instead; although their weather models are probably larger (and therefore less "local") than wunderground's, they seem more accurate. 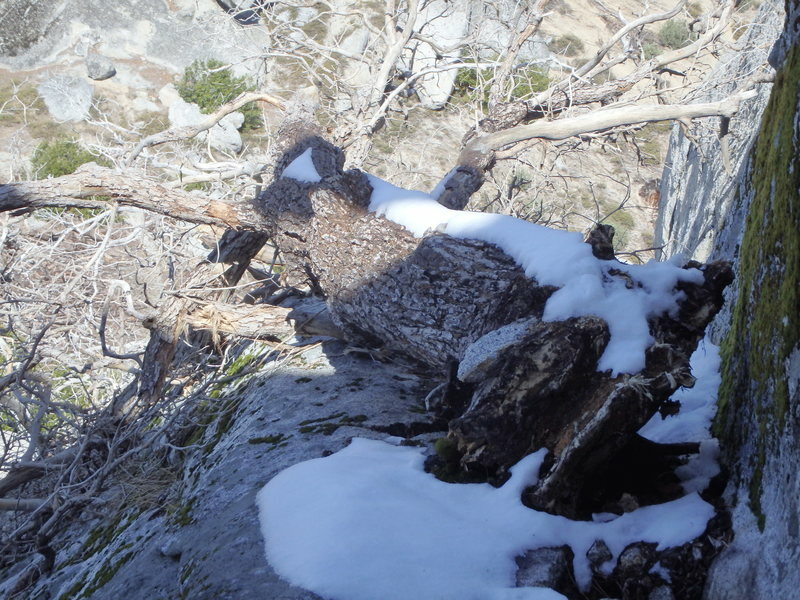 as of March 22nd 2016 for any walk offs the Main Sugarloaf Proper, the Tree has fallen down that folks could stem out to use as a crutch for the down climb section. Now there is a mandatory 5.5 ish 5.6 short few moves of down climbing into the final descent gully.